Oxidizers are chemical compounds that release oxygen when they react with another substance. These chemicals have a variety of uses both indoors and out, but they must be stored properly. Different classes of oxidizers have different levels of reactions, with Class 1 ranking as the most benign, while Class 4 are the most volatile. Several types can be commonly found in the home, usually Class 1. Nitrates, specifically sodium nitrates, are used in the curing of meats and in sausage-making. Salt has long been used as a preservation ingredient in a variety of foods, and sodium nitrate is the active compound in salt that's responsible for preventing the growth of bacteria and preserving the healthy state of the meat and some vegetables. It also prevents meat from developing a spoiled smell, and adds the distinctive red color to the meats. Nitrates are used in the preparation of corned beef, pastrami and sausages, so this compound can usually be found in the kitchens of those who prepare and cook their own smoked and preserved meats. Sodium nitrate can be fatal if consumed in a large dose, meaning as little as 30 grams. Hydrogen peroxide is a safe oxidizer whose main role as an oxidizer is to increase the rate at which flammable materials will burn. It's commonly found in bathrooms, as it's used as a disinfectant and to clean wounds. Hydrogen peroxide can halt the growth of bacteria and other organisms when applied to surfaces such as skin, and can also be used to purify water and begin to break down contaminants. The form of hydrogen peroxide used in the home is safe and noncombustible, while the form used on a larger scale for industrial and commercial cleaning and purification is highly reactive. 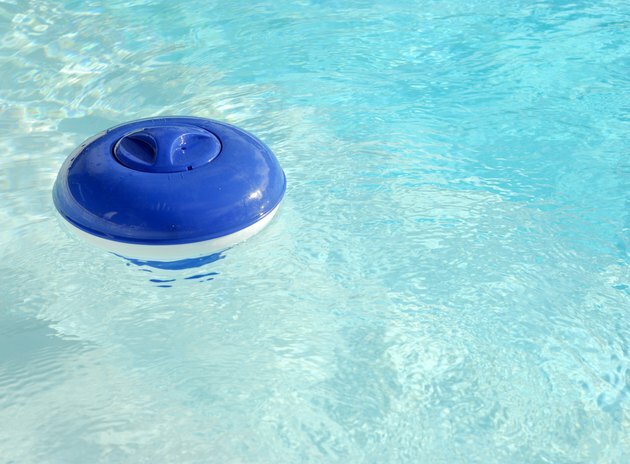 Swimming pool chemicals are some of the most-reactive oxidizers that can be found around the home. Chlorine is a compound that's used as a sanitizing agent in swimming pools, as it will kill bacteria, algae and other microorganisms that would contaminate the water. Chlorine contains compounds called hypochlorites and dichlorocyanurates; these are the active ingredients that make chlorine an effective sanitizer. These compounds are also oxidizers, and can react with other chemicals to release a toxic gas. This reactive nature means that chlorine should be stored safely away from other chemicals that could potentially cause a reaction. Chlorine shouldn't be allowed to come in contact with any other chemicals; safety measures include using only properly sealed containers and scoops that haven't been used with any other chemical. Nitric acid is a powerful cleaner that's often found in household metal cleaners such as polishes. It's also a component in many inorganic lawn and garden fertilizers. Highly reactive alone, it's also dangerous when a compound containing this material is swallowed. Cleaners, polishes and fertilizers that contain nitric acid can cause burning of the soft tissues of the nose, mouth and throat, along with abdominal pains, difficulty breathing and dizziness. These reactions can be among the most severe of all that are related to common household oxidizers, and improper use can result in the need for professional medical attention. What Are the Dangers of Clorox Bleach?